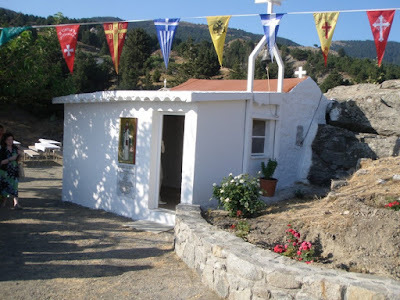 On the island of Kos, in the area southwest of Asklepios and 150 meters west of Kokkinonero (therapeutic waters), is the very old church (or small monastery) of Saint Melo. 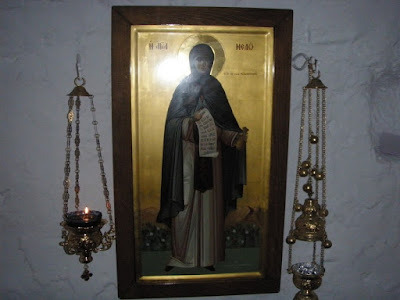 This Saint is the only canonized local female figure, although we do not know her origins. It is very important that despite the lack of historical data, the memory of the Saint is kept in the consciousness of the people, and her veneration has been uninterrupted through the centuries. Despite this the uncertainty of the etymological origin of her name has led to questioning the historical existence of the Saint, which was ultimately confirmed in 1972/73 in the publication of a manuscript from the 15th century (Parisian Codex No. 1362) with verses written in her honor. Iakovos Zarraftis cites evidence that in the year 1018 a hermit built a monastery next to the Church of Saint Melo, and he lived there and healed many of the faithful by pointing them to the therapeutic waters. Indeed, the ruins of the cell of this ascetic are about 50 meters above the chapel, to the south. Foreign archaeologists who visited the church in the year 1933, expressed the opinion that it dates to early Christian times. 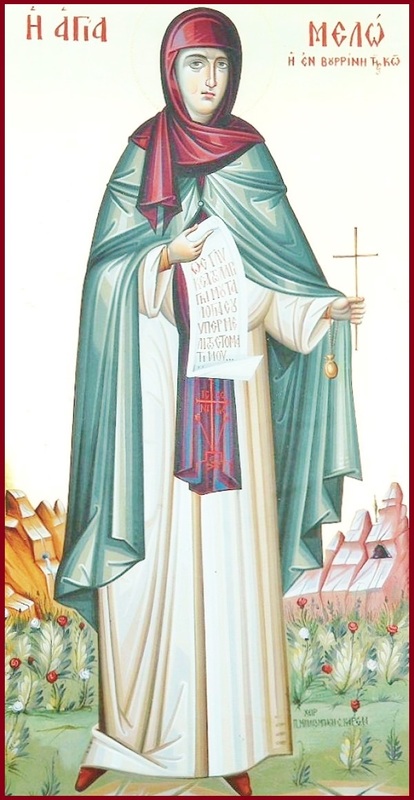 The little information we have about the life of the Saint comes from hymns composed by Metropolitan Metrophanis. According to a study by Professor Zacharias Tsirpanlis, their author possessed the hierarchical throne of the Metropolis of Rhodes, in the period of the occupation of the Knights in the Dodecanese, and had under his pastoral responsibility Kos, as the knights did not allow the ordination of prelates on the other islands. 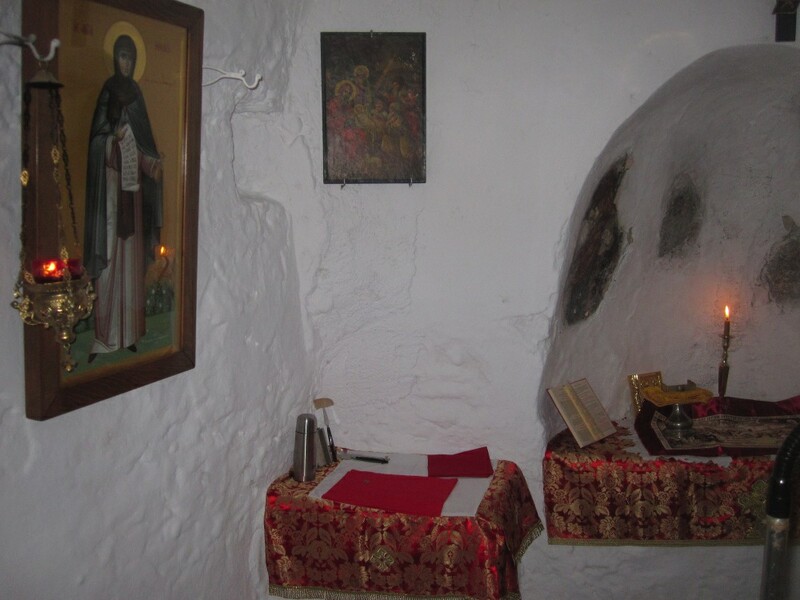 The recent thesis of Metropolitan Nathaniel of Kos and Nisyros, which published the inscription of this church, confirms these findings, and gives the date "1483 of the month of July." 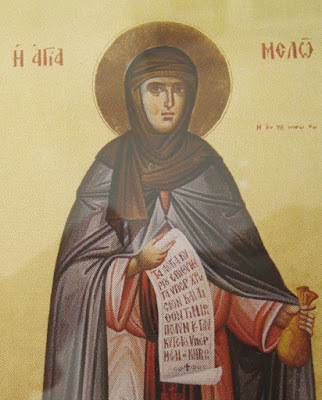 From the verses of Metropolitan Metrophanis we see that before her departure from the world, in order to engage in the life of asceticism, the Saint distributed her belongings to all those in need. Immediately after she went to a mountainous place where, lacking even life's necessities, she dedicated herself to asceticism. Within cold conditions because of the altitude, she managed to subdue her body and the passions. In choosing to isolate herself in the rough mountains of Vourrina, Metropolitan Metrophanis likens her to a solitary pelican, which isolate themselves from others, in order that she may communicate with God. 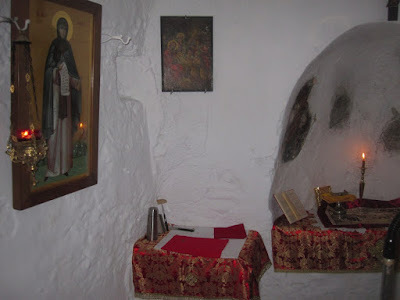 Interesting is his observation that since, by her great humility, she slept among the rocks, the place became a pilgrimage site for pilgrims which led to them building a church ("sanctuary") to the Saint. 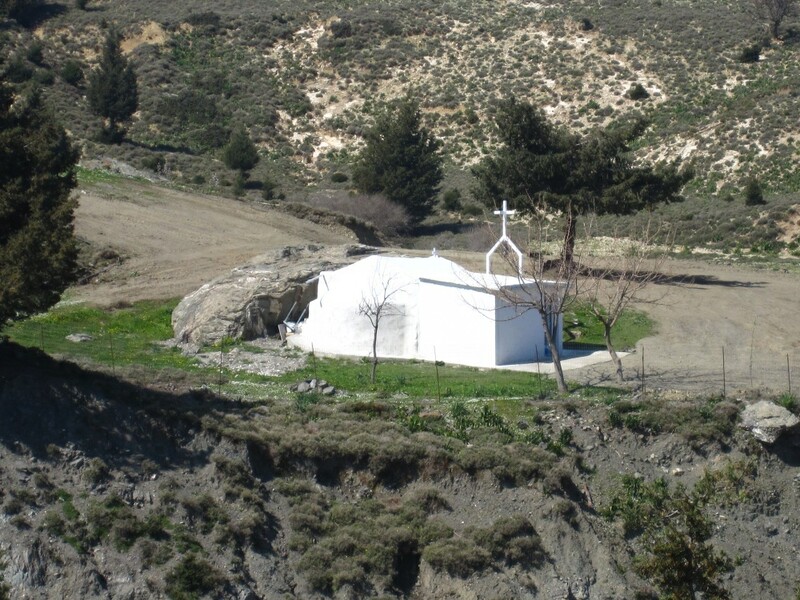 This comment suits the terrain of the area where the chapel was built. On the south side is a rock, on which is mounted the south wall of the church. This rock is identified with her dwelling, as well as the place where she passed away and was buried. Frescoes are preserved in the chapel. The Saint often appears to the people of Kos, near her church, among roses, which indicates her sensitivity and purity. The presence of Saint Melo is a special blessing for the island and her name is more often now given to children and her veneration is becoming more known. 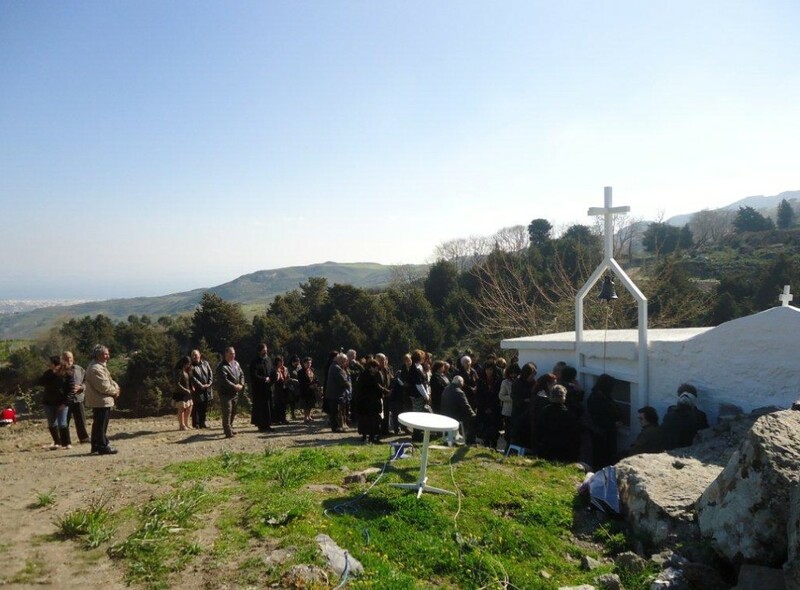 The Holy Metropolis of Kos and Nisyros appointed the memory of the Saint to be celebrated every year on the first Saturday of July. The maiden who loved the desert, let us honor with hymns, Venerable Melo, the boast of Kos, your suffering made you brilliant, and you received grace from above; you make bright the Church of Christ, and for the faithful who approach you, with the fragrant healings you pour forth, entreat for the peace of all and the great mercy.